Integra: Stop where you are, Kim! You’re cornered! Alex: I’ll take care of her. Integra: Don’t! That’ll kill her! Alex: She’s about to kill herself — look! Integra (thinking): Would a fall from this height destroy a ghoul? Now is not the time to find out! ABNA was the joint creation of AtticusBlackwolf and Mr. Sake123, while Chiyo Hoshi is courtesy of Usagi-CRI. The Anti-Boredom Ninja Angel flamethrower. Mechanics hidden in a cute backpack. Includes a secondary flamethrower, for when the first one breaks or when you just want to look cool with two flamethrowers. Ann: But it’s cute!…Well, let’s see what else we can find you. 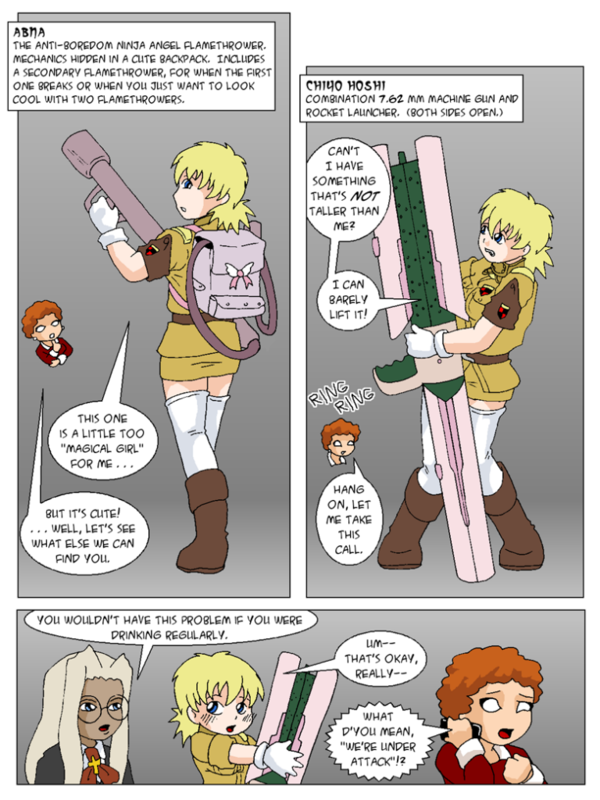 Seras: Can I have something that’s not taller than me? I can barely lift it! Ann: Hang on, let me take this call. Integra: You wouldn’t have this problem if you were drinking regularly. Ann: What d’you mean, “we’re under attack”! ?